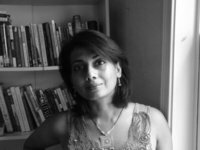 Ramola D is a fiction writer and poet from India, living and writing in the US. Her first collection of short fiction Temporary Lives won the 2008 AWP Grace Paley Award in Short Fiction. Her first poetry collection Invisible Season won the Washington Writers' Publishing House Award in 1998. Her fiction, poetry, and essays have appeared in various journals including Prairie Schooner and Green Mountains Review. She is the recipient of a 2005 National Endowment for the Arts poetry award. " Ramola D said: " Ok--I had to return this book to the library since it was overdue--need to get it back (since I haven't finished it)! Love the first-person narrative, rather intense and edgy story, and interesting themes--a meeting of and various encounters among ch Ok--I had to return this book to the library since it was overdue--need to get it back (since I haven't finished it)! Love the first-person narrative, rather intense and edgy story, and interesting themes--a meeting of and various encounters among characters all hit by lightning, in one form or another, the notion of being turned to ice after childhood trauma and loss, the fragility of relationships. ...more "
We’d love your help. Let us know what’s wrong with this preview of Ghostbread by Sonja Livingston. We’d love your help. Let us know what’s wrong with this preview of The Ice Queen by Alice Hoffman. We’d love your help. Let us know what’s wrong with this preview of Evening by Susan Minot. We’d love your help. Let us know what’s wrong with this preview of The Nanny Diaries by Emma McLaughlin.